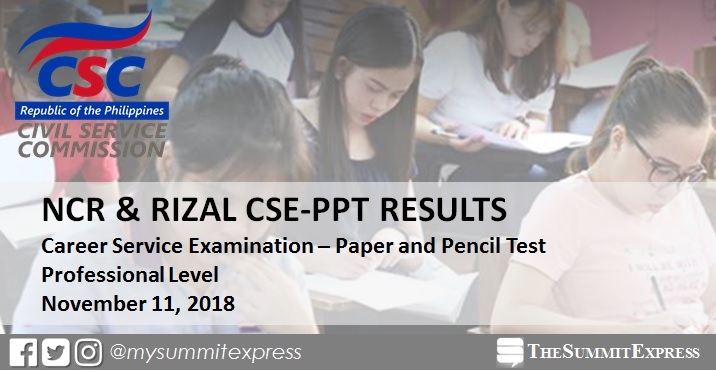 MANILA, Philippines – (Updated January 4) The Civil Service Commission(CSC) announced the results of November 11, 2018 Civil Service Exam- Paper and Pencil Test also known as Career service examination conducted in the National Capital Region (NCR) and Rizal, a reset of the suspended CSE-PPT, on Friday, January 4, 2019 or within two (2) months after the tests. As announced, a total of 3,935 in NCR and 183 in Region IV (Morong, Rizal) passed the professional level of examination. The examination, which was originally scheduled on August 12, 2018 was suspended due to torrential rains brought by the southwest monsoon (Habagat). Results of the August 2018 CSE-PPT for other regions, where exams were pushed through were announced on October 9, 2018 or in fifty-eight (58) days after the exam. The Professional Level exam has 150 items in English and Filipino, and includes questions on numerical ability, analytical ability, verbal ability, as well as general information items such as on the Philippine Constitution, Code of Conduct and Ethical Standards for Public Officials and Employees (Republic Act No. 6713), peace and human rights issues and concepts, and environment management and protection. While there's no official announcement yet of the target release of November 2018 CSE-PPT results, we advise takers to monitor updates on this page until January 2019. Examinees, both passed and failed, may get their individual test results using the Online Civil Service Examination Result Generation System (OCSERGS), which can also be accessed through the CSC website. Note: The date of OCSERGS availability will be posted here soon but you may expect approximately 15 days after the posting of the List of Passers. 1. ID card - preferably the same ID card presented during the filing of application even if already expired by the time/date of claiming. You may also present any government, school or company ID, which must be valid (not expired). 2. Application Receipt with CSC Official Receipt (if available). Note: CSC may require additional document/s as necessary to establish the identity of the passers. A corresponding Advisory on these matters shall be posted in the CSC website. Any other concerns on examination result including verification of examinee number, examinees are advised to coordinate directly with the CSC Regional Office concerned. The CSC Regional Offices handle the releasing of examination results. Those who missed the filing for August 2018 exam may get CSE-PPT on March 17, 2019. Applications may be filed starting December 17, 2018 to January 16, 2019 at the CSC Regional Office (CSC RO), or at any of the concerned CSC RO’s Field Offices, where applicants intend to take the examination. Note: Acceptance of applications shall be on first-come, first-served basis and shall be closed any time before the deadline if the CSC Regional Office has already reached the target number of applicants. Bookmark this page to receive more updates on Civil Service Exam (CSE)-PPT. You may also visit the official website of CSC for more information.